Check out all the excitement from our 2019 event! The third annual NuSmile Summit will be an event to remember! 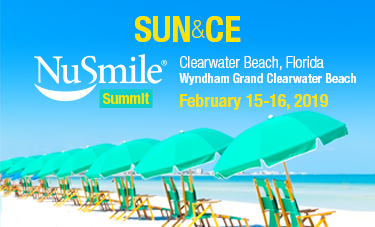 This year will offer up to 16CE, interactive beach and pool activities scheduled for attendees and their guests and some of pediatric dentistry’s most dynamic leaders speaking on a wide array of topics. Come DISCOVER the Difference in beautiful Clearwater Beach, rated the #1 Beach in the United States 3 years running! Create your own agenda and make the most of Sun & CE with NuSmile! Dr. Roger G. Sanger - Managed Care Insurance and Pediatric Dentistry – Opportunities or Problems? Dr. Rhea Haugseth - Infection Control – Do You Know the Nitty Gritty? Dr. Rhea Haugseth - Parents – Are Yours Backseat Drivers? Dr. Stacey Zaikoski - Big Bad Fluoride – Why the Controversy? Warm and inviting, with a splash of excitement. That's the feeling of Wyndham Grand Clearwater Beach lining the tranquil Gulf shore. Take advantage of being just steps away from all the Clearwater Beach area has to offer from miles of fun along the wide-open sugar-white beaches just off the open air lobby/veranda, to world-class activities and sights highlighted with local flavor. Directions from Tampa International Airport (TPA), get on FL-60 W from George J Bean Pkwy, follow FL-60 W to Coronado Dr/S Gulfview Blvd in Clearwater, destination is on the right. The city of Clearwater is over 100 years old. Blessed with an abundance of natural beauty, you will find gorgeous views here of pristine sands and crystal clear waters, and this part of the world also boasts some of the best marine life around. If you take to the waters, expect to find stingrays, sharks, dolphins, and turtles, to name but a few species found here. As well as some amazing beach life, Clearwater is also home to vibrant shopping, dining, and sporting venues. Clearwater lies close to the Gulf of Mexico, so you can also expect warm breezes that make many visitors feel like they don’t want to leave. Click here to plan your day.